Mad Professor Twimble pedal keeps your valuable original sonic footprint intact. Dumble tone in a pedal format. 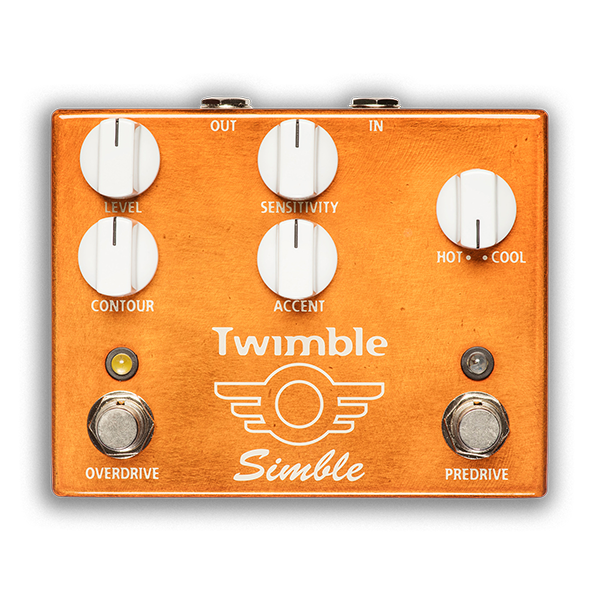 The Twimble is a combination of the Simble Overdrive and the Simble Predrive. Both of the drives have been tailored slightly in order to achieve an even more organic tonal result. As you turn the contour fully clockwise, you will notice the overdrive section now features enhanced clarity with a sparkling top end. The Predrive section has additional sweet compression. This results in a pedal with a more 3-dimension tonal feel and it is even easier to slide between clean and overdriven guitar tones, which can easily be controlled by your guitar volume. In addition, you will notice more warm sustain to ease playing. Naturally, both drives sound excellent on their own, on both single coils and humbuckers. And when activated together they really make you flow. The Mad Professor Twimble pedal allows you to be the foundation of the tone. With the Twimble pedal, your picking attack, your guitar and the pickups you have chosen will retain their character, keeping your valuable original sonic footprint intact. CONTROLS SENSITIVITY: Amount of distortion and compression. LEVEL: Output level. ACCENT: Pick attack and brightness. CONTOUR: Brightness of the output. (Darker when you adjust CCW) HOT/COOL: +10db or +6 db boost. ELECTRICAL SPECIFICATIONS Power: 9VDC (negative terminal at DC-jack tip) Power consumption: 13 mA at 9VDC Input impedance: 2MOhm (Predrive) or 430 kOhm (Overdrive) Output impedance: 50 kOhm Using DC-power jack removes the battery from the circuit. POWER REQUIREMENTS 6F22 9V battery or DC eliminator 2.1 mm plug center negative and positive sleeve. Low output on LED indicates a change of battery is required.